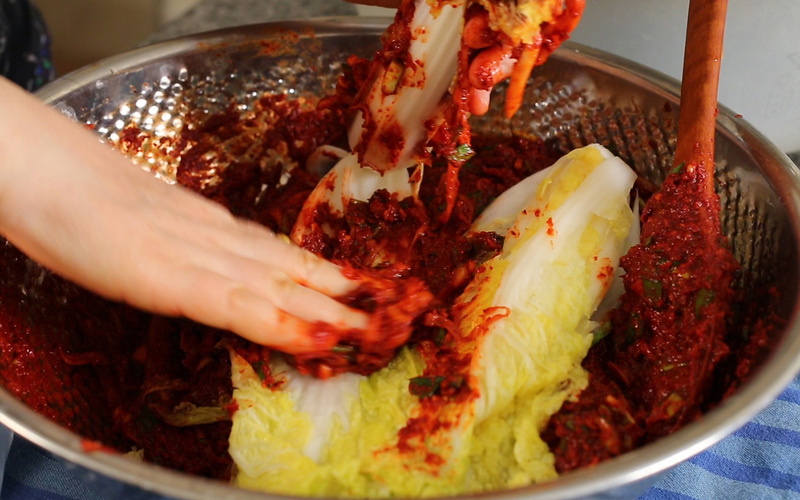 Today I’m going to show you how to make classic, spicy, traditional napa cabbage kimchi called tongbaechu-kimchi, a.k.a. baechu-kimchi or pogi-kimchi. 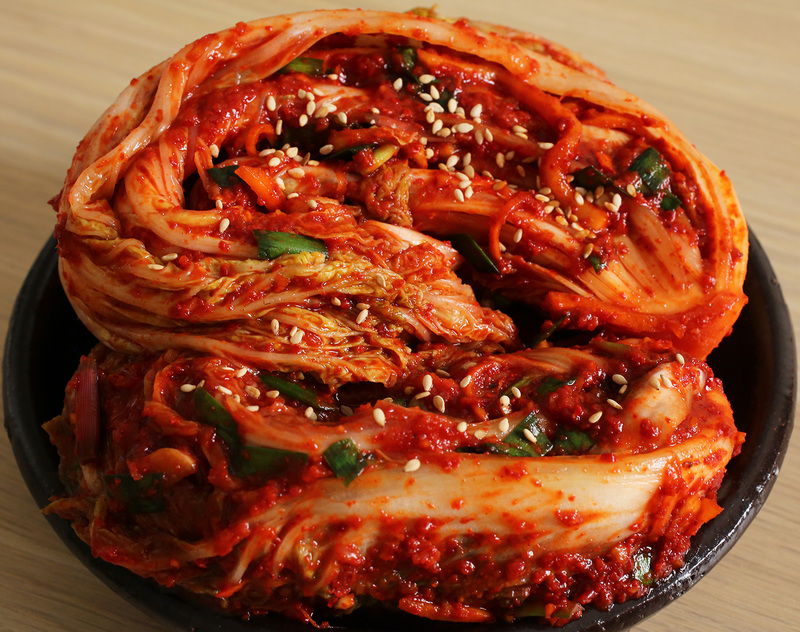 But this dish is so common and iconic among Koreans that we simply call it “kimchi.” When people talk about kimchi, this is the dish they’re referring to, despite the fact that there are many kinds of kimchi in Korean cuisine, and many made with napa cabbage, too. 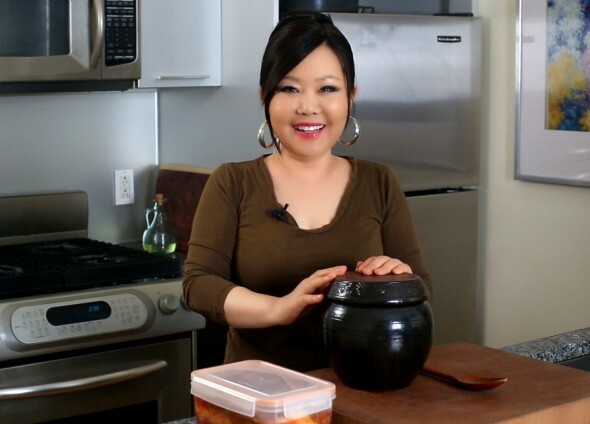 Over the years I’ve posted recipes for a few of them, but I’ve never made an in-depth video for making tongbaechu-kimchi! 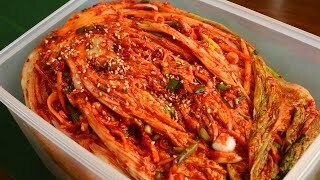 I’ve made a video for mak-kimchi (easy kimchi), which is very similar but is easier because you to chop up the cabbage first, and I’ve made an ultra simple yangbaechu-kimchi (emergency kimchi). 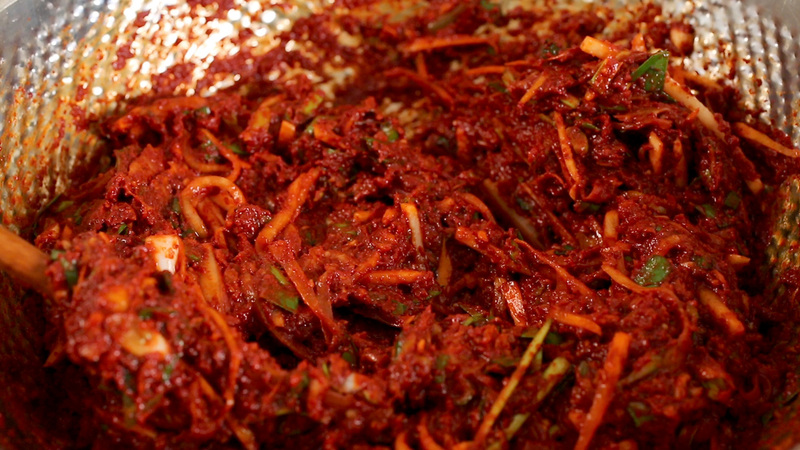 Many years ago I even posted a recipe showing how to make baechu-kimchi with kkakdugi in one batch. But until now, I’ve never posted the most classic and traditional napa cabbage kimchi. 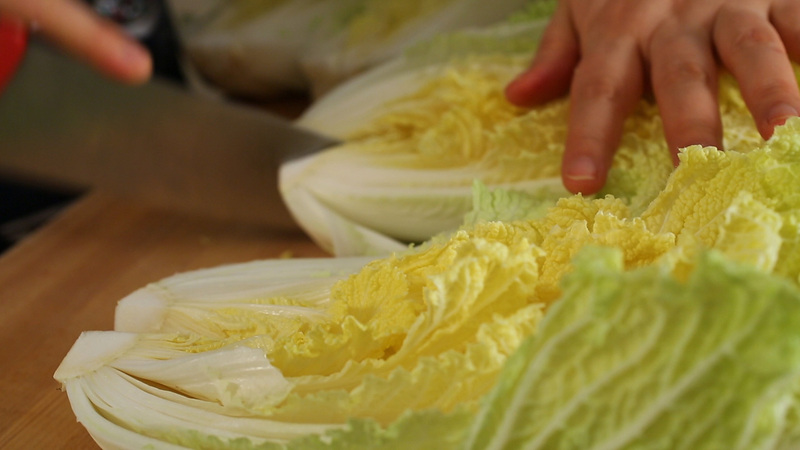 This kimchi uses the whole cabbage leaf, which makes it more labor-intensive than the other ones on my website, because you’ll need to take time to spread the spicy paste leaf by leaf. It’s more work, but this is the traditional style and if you can make this kind of kimchi well, you can consider yourself good at Korean cooking. 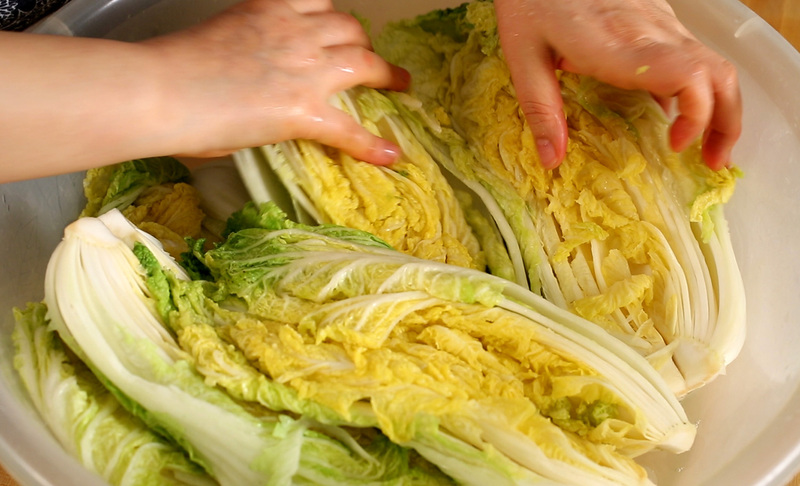 As I mention in the video, my mom used to make kimchi from 200 heads of cabbage! 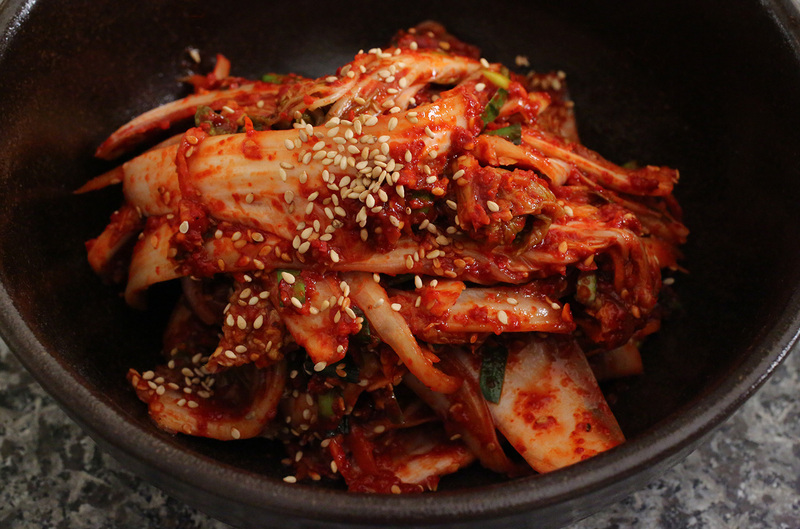 This was kimjang kimchi, made with her friends at the beginning of winter, and meant to last until the spring. 3 to 4 of her friends would come over and help her chop vegetables and most importantly, spread the paste on the leaves. This always needs to be done by hand. They would bring their own rubber gloves, and spend the day talking and laughing, and always had pollock stew or beef radish soup for lunch. They had a lot of fun! At the end of the day they would take some kimchi home with them, but my mom would get all the rest, which lasted my whole family through the winter. And when my mom’s friends needed to make their winter kimchi, my mom brought her gloves over to their houses and helped them, like they did for her. 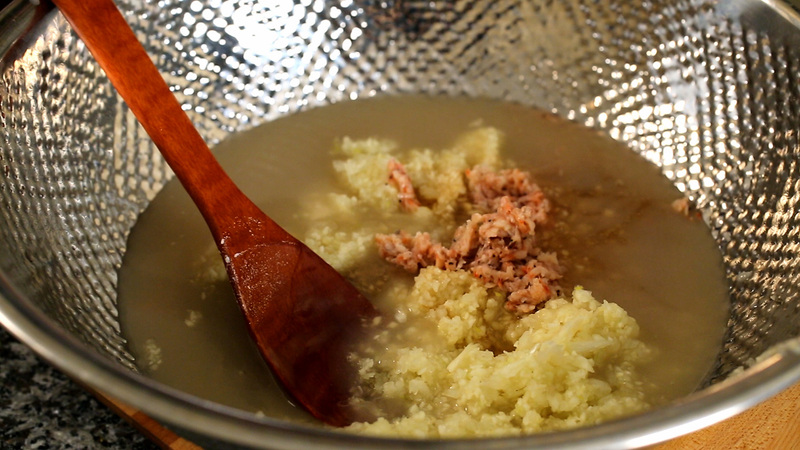 In the video I also show you how to ferment it in a traditional onggi. Using an onggi is not mandatory, but for those of you who have one already, this is how you use it! If you don’t have one, just use a BPA-free plastic container, or a glass container. I hope you enjoy the recipe, and if you love kimchi, I encourage you to make your own kimchi at home. It’s delicious, easy, and a fun thing to do! If the cabbage cores stick out too much, trim them off. 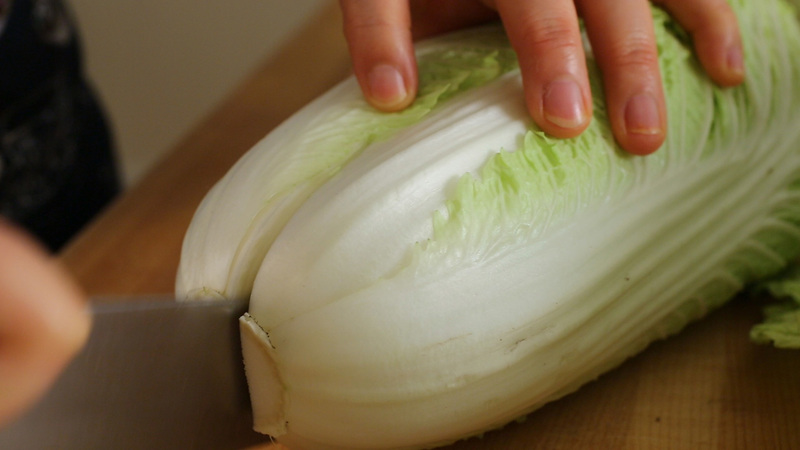 To split a cabbage in half without shredding the densely packed leaves inside, first cut a short slit in the base of the cabbage, enough to get a grip on either half, and then gently pull the halves apart so the cabbage splits open. Cut a slit through the core of each half, 2 inches above the stem. You want the cabbage leaves to be loose but still attached to the core. Dunk the halves in a large basin of water to get them wet. Sprinkle the salt between the leaves by lifting up every leaf and getting salt in there. Use more salt closer to the stems, where the leaves are thicker. After 2 hours, wash the cabbage halves a few times under cold running water. Giving them a good washing, to remove the salt and any dirt. As you wash, split the halves into quarters along the slits you cut into earlier. Cut off the cores, and put them in a strainer over a basin so they can drain well. Pour cooled porridge into a large mixing bowl. 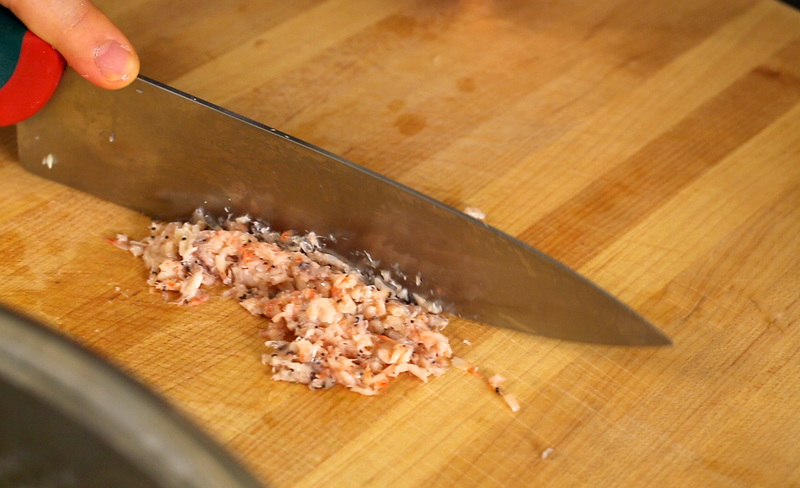 Add garlic, ginger, onion, fish sauce, fermented salted shrimp, and hot pepper flakes. Mix well with the wooden spoon until the mixture turns into a thin paste. Add the radish, carrot, and green onion, plus the Asian chives (or more green onions) and the water dropwort if you’re using them. Mix well. Spread some kimchi paste on each cabbage leaf. When every leaf in a quarter is covered with paste, wrap it around itself into a small packet, and put into your jar, plastic container, or onggi. Eat right away, or let it sit for a few days to ferment. Once it starts to fermented, store in the refrigerator to use as needed. 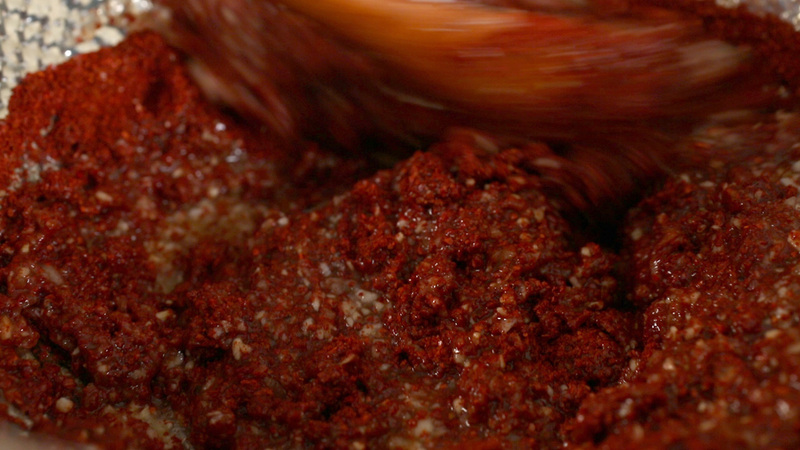 This slows down the fermentation process, which will make the kimchi more and more sour as time goes on. Posted on Sunday, June 22nd, 2014 at 9:44 pm. Last updated on September 11, 2018. Posted July 18th, 2014 at 11:59 am | Log in to reply. I do love all your recipe in here and i have tried to make nappa cabbage kimchi. And i love fresh kimchi too. But my question is after several days store in my refigerator, my kimchi stated to taste bitter. Is it always taste like that when you store it for long time? Posted July 15th, 2014 at 4:11 pm | Log in to reply. Maangchi I can’t find salted shrimp where I live T-T What do you suggest as a replacement? Posted July 11th, 2014 at 10:57 am | Log in to reply. Maaaaangchiiii!!! Yesterday was my first kimchi making day. :) my little kimchis are resting now and getting their beauty sleep! My husband has high blood pressure, so we’re excited to eat kimchi that has less salt and preservatives than the store-bought. Posted July 14th, 2014 at 12:29 pm | Log in to reply. I hope your kimchi fermented well and delicious! Good luck with your Korean cooking! Posted July 10th, 2014 at 1:56 pm | Log in to reply. Posted July 14th, 2014 at 12:30 pm | Log in to reply. oh, salmon worked well? great! Posted July 7th, 2014 at 7:38 pm | Log in to reply. I made this today and used paste instead of flakes… You think it will still turn out good? Posted July 14th, 2014 at 12:31 pm | Log in to reply. How do you like your kimchi? I have never used hot pepper paste in my kimchi but some of my readers let me know their kimchi made with hot pepper paste turned out good. 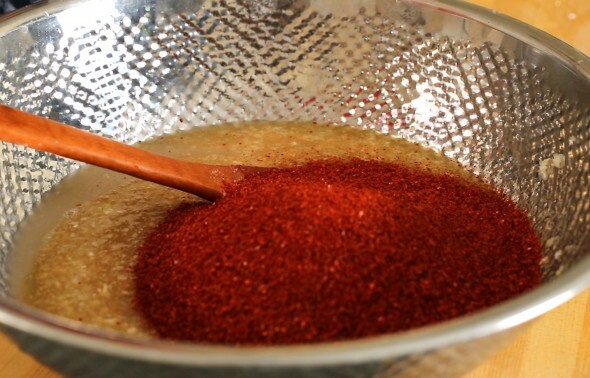 I think hot pepper flakes are still better than hot pepper paste. Posted July 6th, 2014 at 8:49 am | Log in to reply. Posted July 5th, 2014 at 2:15 pm | Log in to reply. Posted July 7th, 2014 at 8:19 pm | Log in to reply. I’m very excited for you, too! Good luck with making good kimchi with your aunt! Posted July 3rd, 2014 at 1:06 pm | Log in to reply. I am 71 and have never tasted kimchi but while reading about it I was overwhelmed by the most amazing craving. I have researched the recipes online and watched the videos and have assembled 5 recipes, but this is the one I will be using. In order to get most of the ingredients I will have to make a 100-mile round trip to Gainesville, FL, because I live in the middle of a very rural, agricultural county (but it doesn’t sell Napa cabbages!) in North Central Florida. I have several friends who LOVE kimchi and I have promised to make enough to share with them. I think kimchi is the true sharing dish one could make and I can’t wait to taste it. Then I am going to make some pork rolls. Thank you so very much for not only your recipes but the wonderful videos. I feel as if I am right there with you enjoying the little “tastes” (I caught you!) and it makes my mouth water. So, many thanks once again. Posted July 4th, 2014 at 10:28 am | Log in to reply. Posted July 2nd, 2014 at 3:15 pm | Log in to reply. 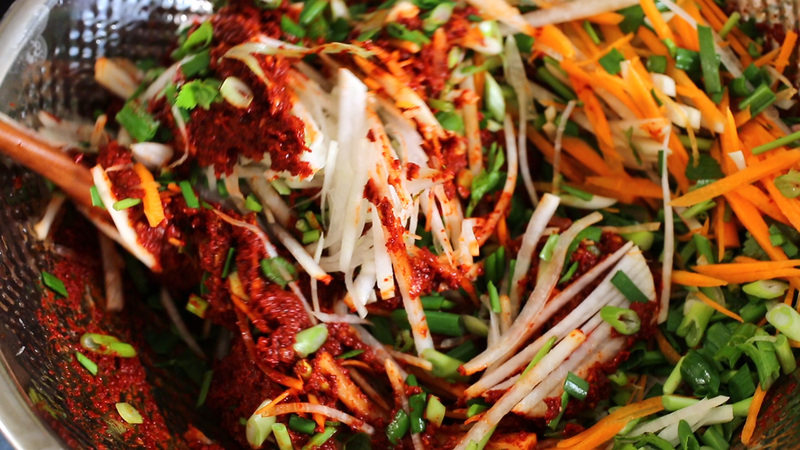 Can you give a recipe for a smaller portion of kimchi ? Cos I live alone and it would take me ages to finish that 6 pound of kimchi n I don’t have much space to keep that much kimchi either. Maybe for 2 head of napa cabbage how much of ingredient I would need to make the paste (seasoning, spices, porridge). Thank you. Posted October 26th, 2014 at 5:15 am | Log in to reply. Why dont you divide all the ingredients that show on this recipe by 2 or 3? Posted July 2nd, 2014 at 9:01 am | Log in to reply. I made it, tried it and loved it so much! Thank you very much. However, I’m now smelling like kimchi because when I opened the jar, it “exploded” like opening a champagne bottle. This was due to the fermenting process. Posted June 29th, 2014 at 10:13 am | Log in to reply. Hello Maangchi. Does anyone ever use mussels for their kimchi? Posted July 29th, 2014 at 8:17 pm | Log in to reply. Yes! You could just chop up the fresh mussels and add it to the paste! It tastes awesome! Posted June 29th, 2014 at 5:32 am | Log in to reply. Maangchi, i was wondering about my napa cabbage. So i salted each layer like you said, and i rinsed it about 5-6 times. But when i tasted a piece of the cabbage, it tasted salty. I was wondering if that was normal? Or is there a problem with the amount of salt, and i should rinse it more? Posted June 29th, 2014 at 11:28 am | Log in to reply. 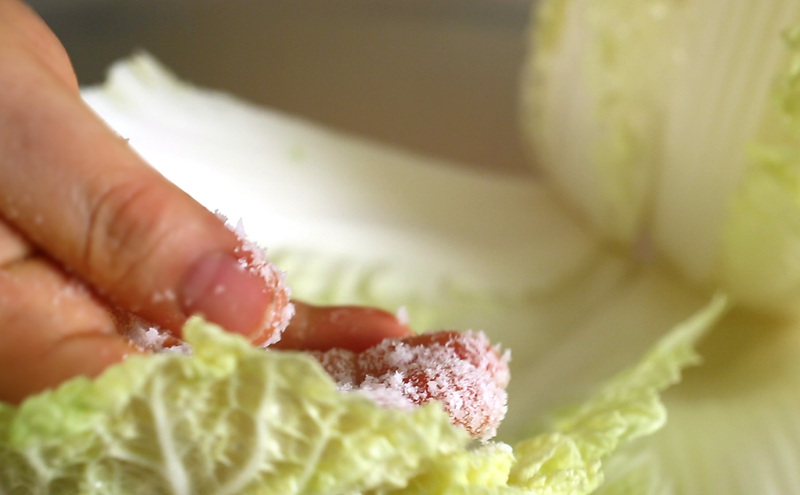 Did you measure 1/2 cup salt for 6 pounds of cabbage? If so, your kimchi will turn out good. Posted June 30th, 2014 at 11:13 am | Log in to reply. I followed the recipe, but it turns out that i just needed to rinse my cabbage a few more times. Anyways, thanks for replying Maangchi! Posted June 27th, 2014 at 5:39 pm | Log in to reply. I’ve made a bunch of your recipes in the past but my favorite (and my family’s) is by far kimchi. When I was in the Air Force, my supervisor’s Korean wife use to bring kimchi in for us every day for lunch. Now I get to make it myself. I make a fresh batch each month and we eat it with everything…from breakfast to dinner and as a snack during the day. Thank you so much for sharing your cooking skills with us. Posted June 28th, 2014 at 11:31 am | Log in to reply. Great! 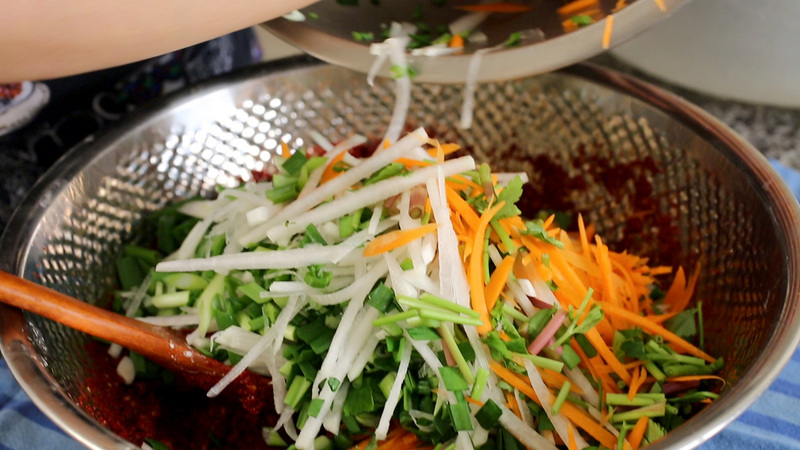 You make your own kimchi on a regular basis! Posted June 24th, 2014 at 9:51 am | Log in to reply. 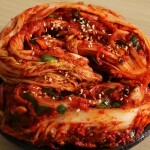 Hi Maangchi, what is the refrigerated shelf life of kimchi? Thanks! Posted June 25th, 2014 at 9:48 am | Log in to reply. 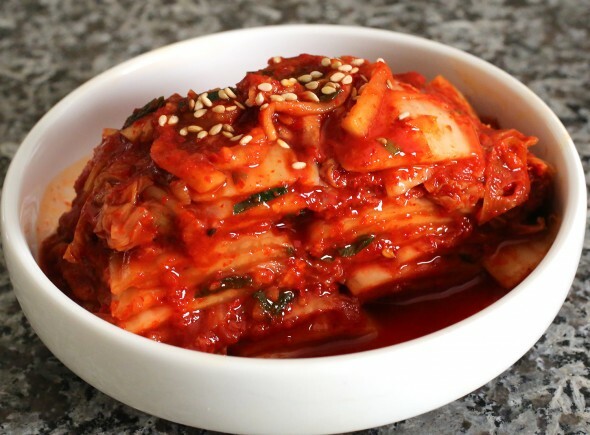 You can store kimchi in the refrigerator for months and months because kimchi never goes bad but ferment. 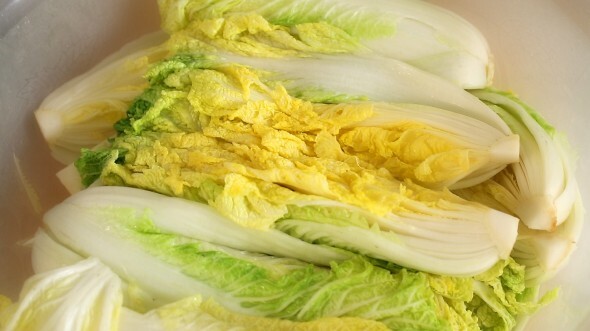 As time passes, the kimchi will get more sour in the refrigerator because fermentation continues. I make kimchi usually every other month. Fresh kimchi will start fermenting in 2 weeks in the refrigerator. Posted June 23rd, 2014 at 8:40 am | Log in to reply. 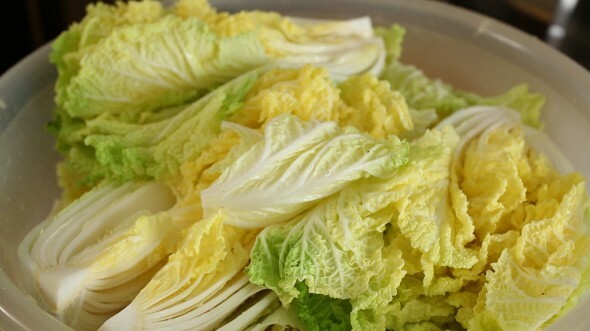 Instead of using napa cabbage, could I use the ordinary cabbage instead? Posted June 25th, 2014 at 9:49 am | Log in to reply. This recipe was originally posted on June 22, 2014 at 9:44 pm by Maangchi. It was last updated on September 11, 2018. The video was watched 11,003,062 times on YouTube & has 164,690 likes!